Richard Gould Antiques, Ltd. is one of the longest established dealers in fine antiques in Los Angeles. Founded in 1955 by Richard and Peggy Gould it is now owned and operated by the second generation, their daughter and son-in-law, Sally and Glen Wright. For over 50 years Richard Gould Antiques, Ltd. has continued to offer the finest in 18th and early 19th century English and American decorative arts including English pottery and porcelain, needlework, glass, period boxes and tea caddies and metalware. An important area of interest is the China Trade. Richard Gould Antiques, Ltd. offers a large collection of Chinese export porcelain for both the beginning and advanced collector and other objects from the China trade including silver, lacquer ware and furniture. We have recently closed our open shop on La Cienega Blvd. 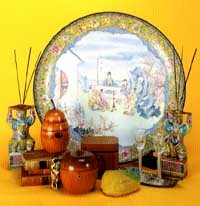 in Los Angeles and we are now dealing privately, on the Internet through www.RichardGouldAntiques.com and at selected prestigious antique shows. We also offer a number of services to our clients. Since we no longer have a shop, we have more free time to scour California for new inventory. We hope you will contact us to be added to our email list so that we can inform you of current updates to our site and important announcements. Please let us know what you are hunting for! Richard Gould Antiques is proud to recommend Argentum-The Leopard's Head of San Francisco, California with the finest and most comprehensive collection of antique silver on the West Coast .